Authors Love Readers is a brand new podcast program, created by my friend and colleague Patricia McLinn. She has so far interviewed about a dozen authors, with more to come. The podcast is aimed at readers who’d like to know more about how and why their favorite authors (or authors who are new to them) create the stories they write. If you could spend an hour talking to me or some other writer whose books you enjoy, these are (we hope) the kinds of questions you might ask or the things you’d like to know. Here’s a link to the interview in iTunes. I’ve known Patricia McLinn for many years, but we got to know each other much better about a decade ago when we served together on the Board of Directors of Novelists, Inc. (NINC), an international organization for career novelists. We worked well together and I developed a great deal of respect for her. That said, I must nonetheless point out that Pat’s yardstick for the ideal length of any podcast, including this one which she now produces, is based on how long it takes her to walk her dog. 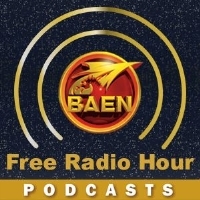 David Afsharirad of Baen Free Radio Hour hosted some of the contributors to the new Baen Books anthology, The Cackle of Cthulhu. New Short Story: "Cthulhu, P.I." Exactly! I’ve come to tickle your funnybone. As the old man knew, I’m not. 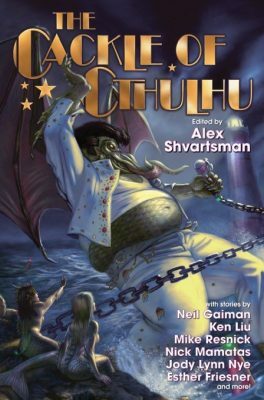 Alex Shvartsman did not invite me into the book on the basis of my non-existent Lovecraft expertise, but rather because I’ve written some humor stories for him in anthologies published by his own company, UFO Publishing. As it happens, when I said, “Sure, I’d love to be in the anthology!” I had never read a word of Lovecraft’s fiction—a fact I refrained from sharing with Alex. So I did my research. That is, I got some Lovecraft fiction from my local library, particularly stories that are considered Lovecraft classics and/or central to the “Cthulhu mythos.” I typically turn down a short story commission that involves more research time than I can spare (ex. a short story for an anthology based on a series of novels I’ve never read), but Lovecraft didn’t write novels, and you can get a good handle on his tone, the subjects or themes he often used, and the Cthulhu mythos by reading just a handful of his short fiction. Also, the assignment seemed like a good opportunity to open some of the best-known works by an influential author whose writing I’d never read. H.P. Lovecraft, who died in 1937, wrote fantastical horror fiction in the early 20th century. An American writer, he was influenced by Edgar Allan Poe, his own nightmares, and various writers of his own era. In turn, writers influenced by Lovecraft include Stephen King, Neil Gaiman, Clive Barker, and Jorge Luis Borges, to name a few. Filmmakers, anime scriptwriters, and manga authors have also cited Lovecraft as an influence. He is often named as one of the most important or influential writers of his genre in the 20th century. Yet despite all that, and despite being a prolific writer, he experienced very little success in his lifetime, and he died in poverty at the age of 46. I enjoyed exploring a little Lovecraft, though the work isn’t to my taste. Lovecraft’s stories are creative, but he tends to portray everything as so menacing, evil, and horrifying that I kept involuntarily blurting, “Okey dokey.” The author’s prose is often imaginative (ex. “great Cyclopean cities of titan blocks and sky-flung monoliths”), but the text dwells so frequently on unimagined, lurking, nameless, unthinkable horrors from the deepest, darkest denizens of the nightmarish corners of the most tormented, unnamed terrors… that his prose often reads to me more like parody than horror. The story I liked best, “Imprisoned With the Pharaohs,” was unrelated to the Cthulhu mythos I was researching, though it’s typical of Lovecraft’s tone and style, and it gives the reader a good feel for his work. Lovecraft wrote it on commission for Weird Tales in 1924. Interestingly, the first-person narrator in this story is the real-life magician and escape artist Harry Houdini—who encounters an ancient Egyptian deity and sinister rites older-than-time, etc., after being abducted while traveling in Egypt. Houdini (the real one) liked the story and wound up commissioning Lovecraft to write several works after that. “The Call of Cthulhu,” certainly one of Lovecraft’s best-known works, seemed like essential reading for me, given that I was committed to writing a story for The Cackle of Cthulhu. I also read “At the Mountains of Madness,” and “The Shadow Over Innsmouth.” I picked up various shiny bits from these works and rolled them into my story, “Cthulhu, P.I.” in which my love of old-fashioned hard-boiled detective movies is revealed, as well as my slight addiction to Airplane-style cheesy jokes. So I hope you like the story and enjoy the anthology, whether you are unfamiliar with Lovecraft, a devoted fan of his work, or someone prone to muttering “okey dokey” while reading his stories. Other authors in the anthology include my dad, Neil Gaiman, Esther Friesner, Ken Liu, Jody Lynn Nye, and more! I have a new short story out, “Lost & Found,” in the sixth annual installment of writer/editor Alex Shvartsman’s popular Unidentified Funny Objects series. My story in UFO5 was a satirical mash-up of The X-Files, Star Trek, Star Wars, Dr. Who, and the classic movie, Casablanca. “The ∏ Files” (“The Pi Files”), featuring Special Agents Mully and Scalder, was great fun to write. This time, though, my story for UFO6 is a little more personal. I used to work part-time at a community newspaper. It should have been a great job. The hours, the location, the work, the community, and the rest of the staff were all pleasant, and the pay was okay. Unfortunately, though, the boss (who was the editor, publisher, and owner of the paper) was an incredibly toxic person, which made working there miserable and stressful, despite all the positive attributes the place otherwise had. In addition to his stunning incompetence, he was also prone to frequent tantrums and irrational rages, he was jaw-droppingly rude, and he regularly insulted and gaslighted the staff. Unsurprisingly, the place had a comically high turnover rate. Departures were an even mix of quitting and getting fired. I was only there for a few months before I was fired, during which time we ran through 5 office managers, for example. One very nice person quit after just one day, telling me as she left how appalled and astounded she was by the boss’ behavior. Well, at one point, the boss wanted to print some “joke” stories in the newspaper. He presented staffers with a few real news stories that he wanted us to riff on. I selected one about NASA, wrote my story as directed, and turned it in. After reading it, the boss informed me that this story was not at all what he had wanted. In fact, it was what he had asked for, but now he was asking for something else. So I wrote another draft. He sent this one back to me with some notes. I revised the material in accordance with the notes and turned it in. Now he gave me all-new feedback, stuff he had not said on any previous iteration, and had me revise it again. I did so. And then he did the same thing again. Next, he told me to start all over from scratch. He couldn’t articulate why, he just knew he wanted something else. I pointed out that I had already done 5 versions. He said I would probably have to do 10 or 12 versions before we were done. It was the “I don’t know what I want, but I’ll know it when I see it” school of editing. I had consoled various writers friends about situations like this over the years, but this was the first time I had dealt with it myself. This is a well-known gambit of completely incompetent and/or malicious editors, and it always goes very badly for the writer. At which point, I finally lost my temper. I don’t remember exactly what I said, though I do recall working into my tirade the information that I’d never before been asked for 5 rewrites because I’d never before worked with such an incompetent editor. I took my work away from him and stalked out of his office after telling him my next version of it would be final, period. Not long after that, I later learned, he posted a want-ad for someone to fill my position, and after he arranged a start date with the new hire, he fired me. The sad part, so to speak, was that the pieces he kept spiking were funny, and none of them ever saw the light of day. So when Alex Shvartsman asked me to participate in UFO6, I decided to turn my ideas for that article into a short story. 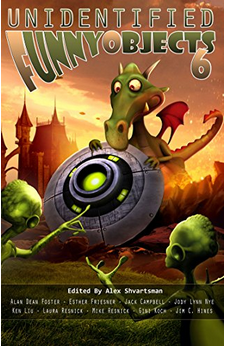 The result is “Lost & Found,” in which some surprising visitors emerge from a UFO orbiting Earth. Yep, getting published is still the best revenge. My newest short story, “Achilles Piquant & the Elsinore Vacillation,” is in this month’s (November 2016) Galaxy’s Edge Magazine, edited by Mike Resnick (my dad). It’s available free online this month, and will be available in ebook and print editions of the November issue for the foreseeable future. After publisher Shahid Mahmud got the old man to agree to edit the mag, Pop asked me to submit a story for the second issue…. But as you may have noticed from the cover here, I am making my debut in issue #23. Oops. Also, despite having written about 70 short stories, I am not a natural short fiction writer. With only a couple of exceptions (and this story is one of them), I have written all of my short stories for themed anthologies where an editor gave me a deadline (and not meeting it would mean not being in the book) and, more to the point (for me), story parameters. Sometimes the parameters are simple, such as “write a fantasy story of 3K-6K words about a horse or equine creature” (Horse Fantastic, for which I wrote “No Room For the Unicorn,” now available in my Highway To Heaven collection). Sometimes they’re very specific, such as “write a science fiction or fantasy story about Sherlock Holmes” (Sherlock Holmes in Orbit, for which I wrote “The Adventure of the Missing Coffin,” now available in Maybe You’ve Heard of Me?). And sometimes they’re complex (I wrote “Your Name Here,” a satire about population control, for How To Save the World, a 2013 edition of Fiction River Magazine, for which editor John Helfers established detailed parameters about the sort of science fictional challenges he wanted to see tackled). I can do that kind of thing. I’ve done it 5 or 6 dozen times, after all. But my natural “lean,” as both a writer and also a reader, is much more toward novels than toward short fiction. And so I tend to stall when the only parameter is “write a science fiction short story one of these days for this bi-monthly magazine.” Hence the passage of many issues of the mag before I submitted a story (and during which time I wrote short stories for several themed anthologies). Anyhow… around the time I was trying to think of a short story for Galaxy’s Edge, I read a passage in Christopher Hitchens’ memoir, Hitch-22, in which he described a dinner party game of inventing Robert Ludlum-style titles for Shakespeare plays. My sort of game! I love Shakespeare, and I love spy novels (and have enjoyed Ludlum novels like The Bourne Identity, The Rhinemann Exchange, and The Matarese Circle). I also love word games, and I even enjoy brainstorming titles (some writers hate it). Salman Rushdie, author of The Satanic Verses and Midnight’s Children, was one of the diners playing this game with Hitchens, and he suggested The Elsinore Vacillation for Hamlet. I thought this was a delightful title, especially since Hamlet’s vacillation drives me crazy (it is not among my favorite Shakespeare plays). So I decided to use that title (crediting Mr. Rushdie, of course) and write a Hamlet parody. I’ve also lately become a big fan of Agatha Christie, whose writing I only tried for the first time a few years ago, and I have been gradually working my way through all her books—I’m about halfway there. So my Shakespearean tale cross-pollinated with a cozy murder mystery, set aboard a starship, in which an indecisive and ambitious Lieutenant Hamlet secures the assistance of an investigative android, Achilles Piquant, to investigate the sudden death of the ship’s captain. I had fun writing it, and I hope people have fun reading it. MillenniCon is a science fiction/fantasy fannish convention in the Cincinnati/Dayton/Ohio Valley area, so it’s local to me (I’m a longtime Cincinnatian and now live in Northern Kentucky–so close to Cincinnati than I can easily walk to downtown Cinti, across the Ohio River, and can see parts of it from my back yard.) They like to feature local sf/f writers, and past GoHs include fellow Cincinnatians Mike Resnick (my dad) and Stephen Leigh aka S.L. Farrell, as well as Midwestern residents John Scalzi, Jim Hines, Eric Flint, and Tobias Buckell. Over the years, they’ve also brought in guests from farther afield, including Robert Sawyer, Connie Willis, Catherine Asaro, David Brin, Larry Niven, Lois McMaster Bujold, Joe Haldeman, and so on. As you can imagine, I am honored to be in such company. I was settling down to sleep around 2am that night when I realized I had forgotten a bunch of essential things at home–such as something to read to the audience at my reading in the morning–so I made a middle-of-the-night trek back to my house across the river to get forgotten items. Upon arriving home, I surprised the Infamous Hector in the middle of constructing a catapult in the cellar by using–it seemed–pieces of a Scrabble game he had liberated from the top shelf (9 feet high) in an upstairs closet. So it was a rather long night. Like many others at MillenniCon, I was jailed the next day. (This is a fundraiser whereby people pay a few dollars to arrest and imprison anyone of their choice for 5-15 minutes in a temporary jail that’s constructed in the lobby. The jailer is a well-armed Klingon, so I went quietly, officer.) That evening, writer Stephen Leigh aka SL Farrell, who has been publicly performing in rock bands for decades, did a great job of entertaining the audience during the intermission at the masquerade while we waited for the judges to deliberate and make their decisions. Afterwards, on my way to the parties, I saw a giant blue sea monster in the hallway, and everyone said I’d had enough to drink. But I saw it again the next day, too, after all the effects of wine and questionable company had worn off. Hah! Sunday wrapped up with some more programming, during which time I realized that I probably shouldn’t spend so much time at parties when I have a heavy programming schedule, since I am not quite the spring flower that I used to be. Overall, I believe that being a good GoH means being polite and accessible, available to committee and attendees during most waking hours during the con, well-prepared on programming, and courteous to everyone who has shown up in hopes of having a nice time. So I tried hard to follow that example, since that’s all much easier than, oh, writing a book, and certainly not a lot to ask of an author in exchange for making her the honored guest of a convention. And concoms make it a very positive experience for the GoH by running a good con where everyone has a good time, as well as extending warm hospitality to the GoH. All of which was the case at MillenniCon, which was a happy experience for me and, as far as I could tell, for everyone else, too. 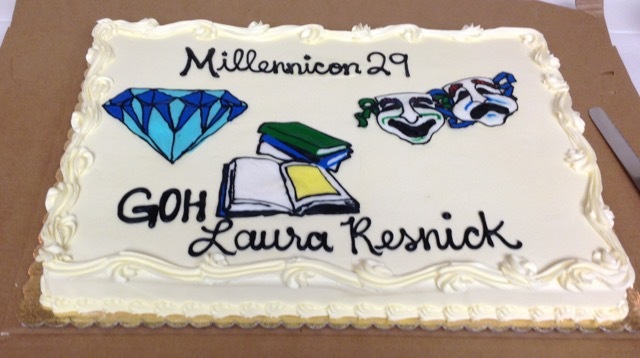 Next year is MillenniCon’s 30th anniversary, for which they’re planning big festivities, including inviting back some former GoHs, such as my dad and my friend Jim Hines–so I’ll certainly be in attendance! I started writing this in response to a post in a discussion on The Passive Voice, a blog I read regularly, in which a writer whom I respect noted that one of the drawbacks with indie writing (aka self-publishing) in sf/f is that the work so rarely gets noticed in awards venues, seldom getting nominated or appearing on awards ballots. But my response got so long, I thought to myself, you know, this is really a blog post. And now that I have a blog (! ), I should post it there. So here goes. In terms of whether it’s a disadvantage worth considering (when deciding whether to self-publish novels or submit them to publishers) that indie fiction in sf/f gets little/less attention in the awards process… I think sf/f awards ballots are probably both less important and more accessible than they’re usually given credit for being. The last time I was nominated for an award in sf/f was 1993, when I won the Campbell (best new sf/f writer). So I have not appeared on an sf/f award ballot for nearly 22 years. Yet since 1993 (when I had no intention of writing sf/f novels), I’ve released 11 fantasy novels from major houses, and currently have 5 more under contract; have released another 50-60 sf/f short stories, and currently have 5-6 more in production or owed to editors; and I was asked to write a column for the SFWA Bulletin (which I did, 2000-2003), though it was then already 7 years since I had last appeared on an awards ballot. Writing has been my full-time living most of the time since 1993 (and for several years before that). I’ve worked regularly/steadily as a writer most of that time, and I’ve been working constantly in sf/f ever since I got literary agents out of my career. (Contrary to the popular mythology surrounding them, my own repeated experience was that literary agents were a genuine impediment to getting book contracts and earning a living.) A key reason (apart from my general inertia and disorganization) that I don’t submit short fiction to magazines and still haven’t self-published any frontlist (though I always intend to do both things!) is that I’m always running to keep up with my sf/f book contracts and my obligations to sf/f editors who’ve commissioned short stories from me. Moreover, when I saw the promo materials (aimed at head buyers and distributors) for my first-ever fantasy novel, In Legend Born (Tor Books, 1998), it didn’t mention my Campbell Award, so I pointed this out as an obvious mistake that should be rectified. But the publisher told me, nope, they weren’t putting that anywhere in the promo material, because it was irrelevant and no one cared. I’ve also learned over the years that I make more substantial book advances than some Hugo, Nebula, Tiptree, etc. winners—though less than others, of course. Because book advances are largely based on sales or anticipated sales, rather than on awards. 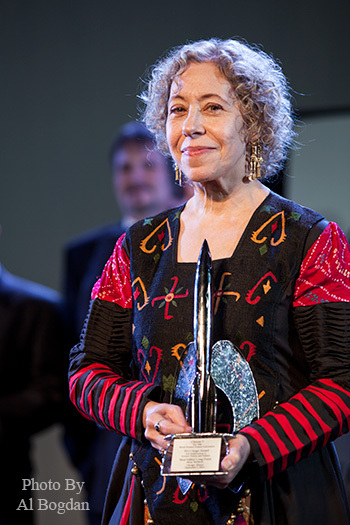 My editor and DAW Books co-publisher Betsy Wollheim receiving a well-deserved Best Editor Hugo in 2012. 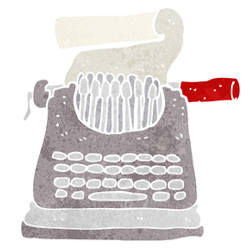 So whatever the challenges of publishing indie that ones takes into account… my own experiences ensure that I’m not at all convinced that getting awards and nominations matters that much in a novelist’s career. Not enough, at any rate, to be factored into weighing the decision of whether to self-publish or to submit to publishers. Which is not to say that awards don’t matter at all. For one thing, who doesn’t enjoy getting such recognition and kudos? Who doesn’t enjoy having a fantastic trophy in their office, as well as a daily reminder, within easy view, that they have published at least one thing that a lot of awards voters thought was the best work of the year in its category? Who doesn’t like subtitling their own name with, “_____ Award winner”? Winning awards is very satisfying, and personal satisfaction rates high in my world view. 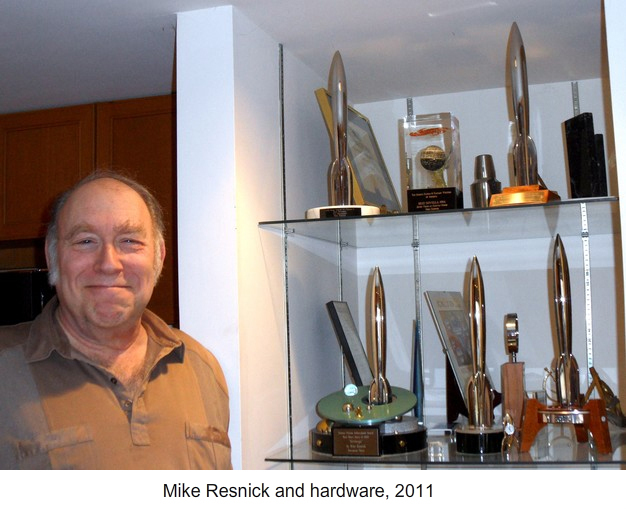 My dad, sf/f writer Mike Resnick, whose name recognition grew due, in part, to appearing often on awards ballots (and sometimes winning). Moreover, getting on ballots regularly raises the profile of your name, in general, which is very handy. Name recognition is a key thing the writer strives for, so that editors will read the work quickly and eagerly (rather than let it gather dust in some remote corner of the office for two years), and so that readers will buy the work—nay, pre-order it! And having said that, the good news is that there’s no reason indie novelists in sf/f can’t successfully pursue name-recognition-through-awards without a traditional book publisher in their careers, since most award categories in sf/f aren’t actually for novels, after all. For example, the talented Kameron Hurley, whose sf/f novels are currently published by Angry Robot, won two 2014 Hugos, one for Best Fan Writer and the other for Best Related Work; both of those awards are for material that originated on her blog (some of it subsequently republished elsewhere). My friend Jim C. Hines, a popular novelist published by DAW Books, won his 2012 Hugo for Best Fan Writer, based on material on his blog. If you look through the Hugos history, you’ll see various other such examples. Nor do you need traditionally published novels to attract nominations for your “other” work. Ted Chiang’s name appears on the Hugo and/or Nebula ballots almost every time he writes something—and he has never written a novel. Ken Liu, whose first novel will be released in April 2015, has previously won the Hugo, the Nebula, and the World Fantasy Awards with his short fiction. There are regularly nominees in the short story, novelette, and novella slots on all of those awards ballots who haven’t published novels, just as there are winners in the related works and fan writing categories every year in the Hugos. And a writer who gets on those ballots can just as easily put “Nebula finalist” or “Hugo nominee” (or winner) on her indie-published novels as a traditional publisher can. Yes, award-winning short fiction in sf/f is still still usually published by traditional or semi-traditional venues (as per the above examples), rather self-published. If your goal with a story is to get awards attention, then submitting to sf/f fiction magazines is a strategy you should seriously consider. This is business, not ideology, so you should always match your strategy for a given project to your goals for it, rather than burying your goals in unthinking loyalty to The One True Way of releasing your work. Anyhow, the good news there is that the exclusive digital license with most sf/f markets for short fiction is reasonably brief, compared to the decades-long exclusive digital license that major book publishers still present as “non-negotiable” in their contracts. And, of course, if a work of short fiction doesn’t sell after being submitted to every viable market, you can (a) revisit the markets that have changed editors since you got your rejection, or (b) self-publish it, which is an option that didn’t exist in the Jurassic era when I won the Campbell. Whether you do that, or self-publish your short fiction from the get-go, indie release is not a graveyard-of-certain-obscurity anymore in terms of awards, though you’ll presumably have to campaign even harder than a traditionally published short fiction writer does (and let’s not be coy–many people do indeed campaign for nominations and awards in sf/f). Also, while others may disagree, I feel that I see a significant (not predictable, overwhelming, or universal; but significant) corollary each year between writers who get on sf/f awards ballots and writers who’ve made themselves very noticeable in the sf/f community through high-profile blogging, Tweeting, and social media, and/or many con appearances, and/or SFWA service. So I think an indie writer who wanted to raise the profile of her books through awards/nominations would be sensible to employ a strategy of submitting regularly to the sf/f magazines whose contents appear often on the awards ballots while simultaneously writing a blog where she works shrewdly on attracting a large blog audience (note: this requires more than ranting at people to go read your blog), Tweeting effectively, writing a lot of “related works” and “fan writing” material, and perhaps serving in a prominent, visible SFWA volunteer role. It’s an exhausting prescription (which is why I haven’t tried it), but I really do think that if a person’s fiction is good, then her chances of appearing on sf/f awards ballots within 2-3 years, if she maintained that schedule, would be strong, due to having attracted some name recognition, through various means, among people engaged in the sf/f world and likely to participate in nominating works for awards—which is a small, targetable community, after all. Finally, keep in mind that lots of people read sf/f who don’t attend sf/f cons, read no sf/f blogs or newsgroups, and pay little-or-no attention to sf/f awards. That’s why writers who’ve never been nominated for an sf/f award (or who, like me, haven’t been nominated for anything in over 20 years) can have decent writing careers.